Most Americans, if they ever tried seaweed at all, probably gave up on it after the first try because it is either very tough (kelp) or bland (nori). 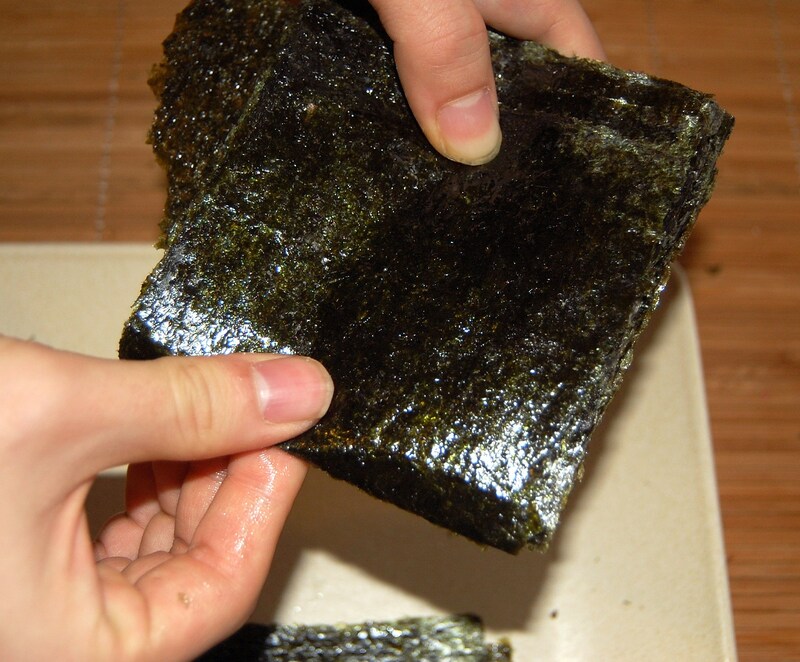 However, well-prepared seaweed can be very tasty as well as extremely nutritious. 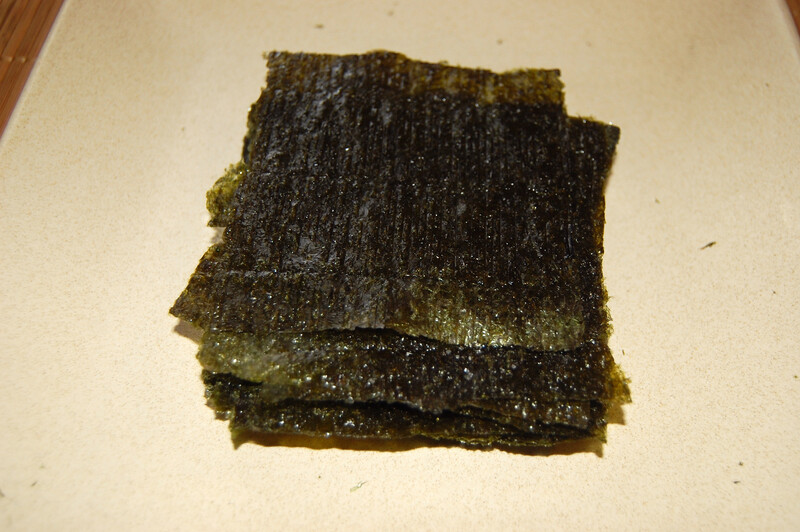 Koreans have developed a wide menu of tasty seaweed snacks. 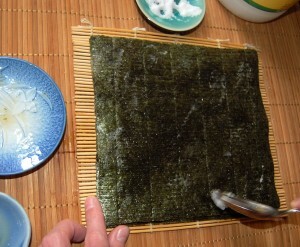 The basic strategy is to soak seaweed in oil, season it, and bake it briefly. The oil and seasonings make the seaweed taste much better. The only trouble is that, like most food products sold in this country, commercial varieties tend to use low-quality oils. 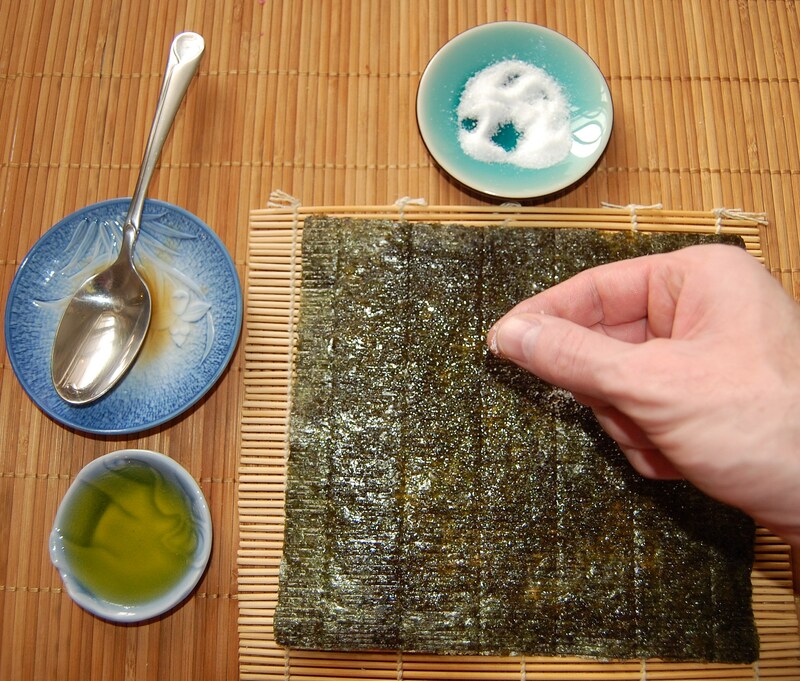 On our supplement recommendations page, we mistakenly linked to some Korean seasoned seaweed products that used unhealthy oils – canola oil or corn oil. (We’ve since corrected that; the current versions use olive oil and sesame oil.) Commercial varieties are also unreasonably expensive (in our view). But seasoned seaweed is very easy to make at home. 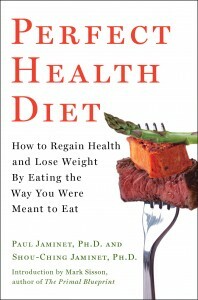 Today we’ll show you how. 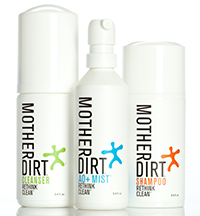 A healthy, low-omega-6 oil. 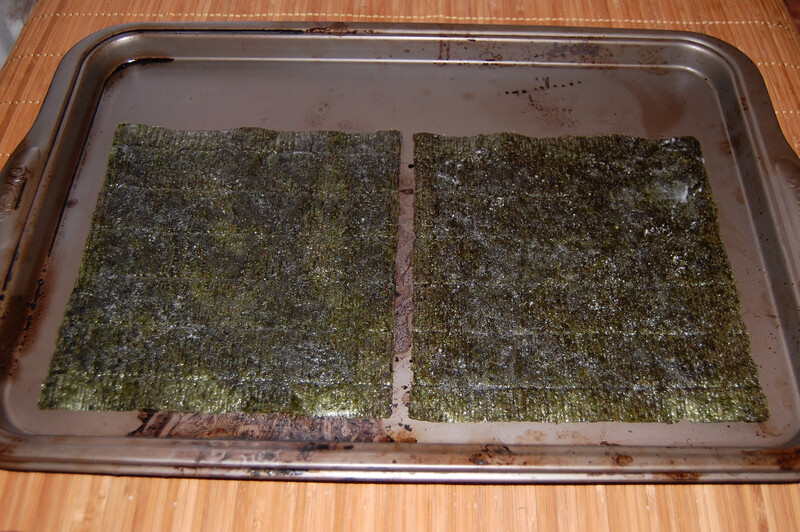 We used olive oil on some sheets and coconut oil on others. Next time, we’ll try beef tallow and clarified butter. Seasonings. We used sesame oil and sea salt. 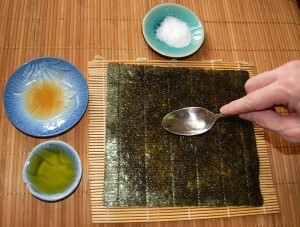 Spread the healthy oil on the seaweed. 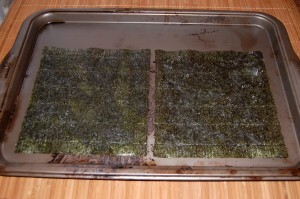 Each sheet will require about 1/2 to 1 teaspoon of oil (dried seaweed can really soak up oil). We favor using the back of a spoon to spread the oil. We baked each sheet individually, but it might be possible to bake a whole stack at once — we’ll try that next time. Voila! Just like grandma in Korea makes it. 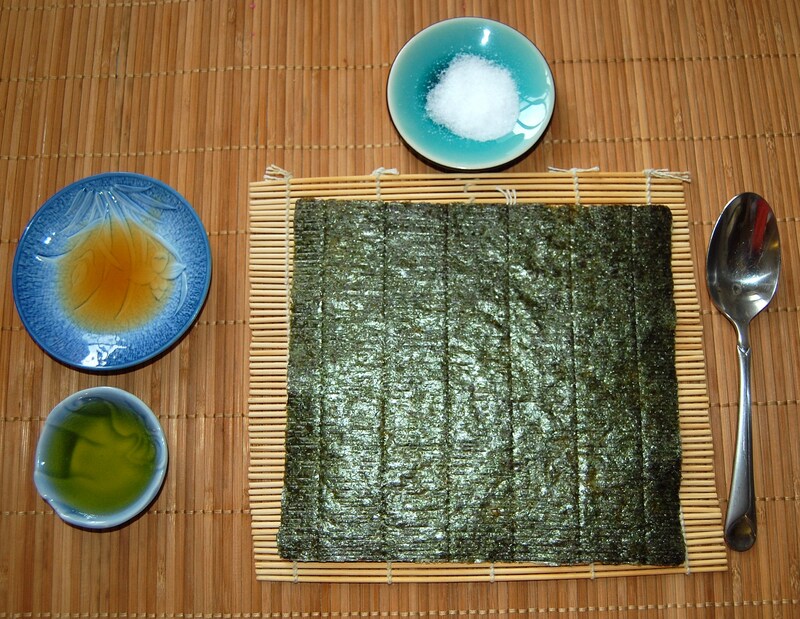 Eat the seaweed alone or with rice.